I'm a garden designer and educator and began making miniature plants to illustrate gardening principles to my design and horticulture students. The miniature containers and gardens were popular as gifts for shut ins or friends who were gardeners. Eventually I combined my experience with scale miniatures to produce accurately detailed plants and simplified plant kits for people who wanted to create special gardens or conservatory plantings for their miniature scenes in scales of 1:12, 1:24 and 1:48th, with occasional commissions in 1:6. My background in design means I often work with historical recreations, and I use my knowledge to create miniature plantings that accurately reflect seasons and historical periods. 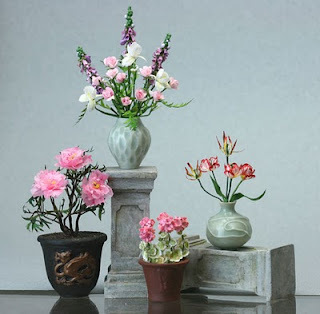 I pride myself on producing miniature plants which can be identified as individual named and historic varieties, with accurate leaf, petal and often stamen details. All of my miniature plants transmit light through their petals and leaves the same way their living counterparts do, with parts in the closest possible scales to the originals, both in thickness and size. I'm happiest creating gardens or planted containers, but as a trained florist I often use my skills to create various period floral displays in my own containers as well as those of other artisans. A background in museum work means I make all of my plants with wire, artist's papers, watercolors and acrylics, and archival glues that are suited to long term display and storage. I produce my own line of stoneware and some resin pots for miniature plants in the scales of 1:12, 1:24 and 1:48. These are based on planters that are either historic, or currently available to the horticultural trade in the sizes I reproduce accurately in miniature scales. The larger 1:12 stoneware planters can be used to grown tiny bonsai or other dwarfed living plants. In recent years I've begun to offer simple plant kits of coloured paper parts, as well as laser kits of parts designed to be custom coloured by miniaturists to suit their particular garden style. I enjoy teaching classes on making miniature plants and the line of kits has developed in response to requests from students who love the accurate colours and growth they can reproduce in miniature. In my 'other' miniature career I write the miniatures site at http://miniatures.about.com for About.com Inc. a division of the New York Times. 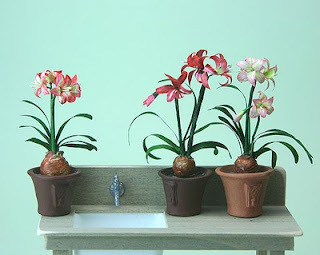 I've also written several articles on making miniature plants for past issues of The Doll's House Magazine. You can see my work at local fairs in the Pacific Northwest of North America, or at the Kensington Dolls House Festival. Artisans in Miniature is now Tweeting!